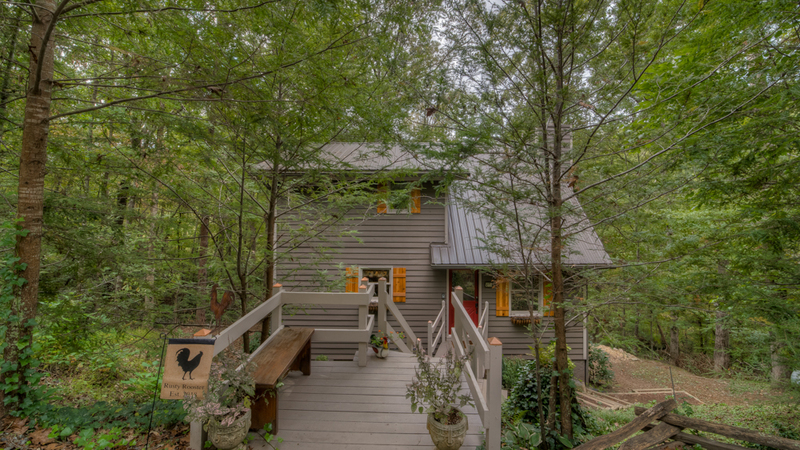 Picture the peaceful solitude of a Georgia mountain cabin rental, hidden in the woods with sunlight filtering through the tall trees. Close your eyes, and the only thing you’ll hear is the soothing sound of the stream that flows through the property year round. It’s like being in a fairytale forest, and it’s the magical atmosphere you’ll find at Rusty Rooster (formerly know as Above the Brook). 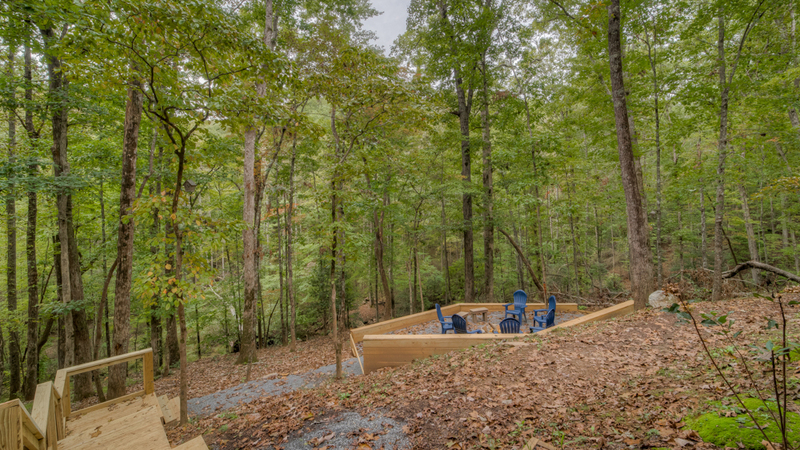 Secluded and private, yet just five minutes from downtown Blue Ridge, it’s convenient to everything but feels completely far away from it at the same time. Inside, the cabin is bright and airy, mostly pine and decorated in rustic, cozy style with comfortable furniture and old plank floors. A gorgeous stone wood-burning fireplace is the centerpiece of the main living area, with a 48” TV on the beautiful cedar mantel above it. The well-stocked kitchen features wood cabinetry, black and stainless electric appliances, blender, toaster, hand mixer, electric teakettle, crockpot, griddle, drip coffeemaker, and the dining table seats six. You’ll dream in comfort in your choice of three cozy bedrooms, each with private en suite bath, 28” TV, full size closet and ceiling fan. There are king beds in the main level and upstairs master bedroom, which has a vaulted ceiling and bathroom with shower. Downstairs bedroom near the game room has queen bed. In the game room, where there’s a 46” TV, air hockey, foosball, darts, and board games for your amusement and twin bunk beds. The cabin is designed for outdoor living, with a gas grill on the main deck with plenty of seating including a picnic table, loveseat, and rockers, and on the lower level deck, a seating area and a hot tub with room for five. There’s a fire pit with benches and a path to a bench beside the creek. As lovely as it is, you’ll want to explore beyond the property, and there are many options nearby including hiking trails, tubing on the Toccoa River, wine and beer tastings, picking fruit at Mercier Orchards, riding the Blue Ridge Scenic Railway and of course, the shopping, dining and a great park for kids in downtown Blue Ridge. If you love antiques, shops abound there and in neighboring towns like Jasper and Blairsville. Also, you can enjoy jet ski and pontoon rentals at Lake Blue Ridge or relax at the marina bar with local music. Rusty Rooster also provides WiFi, cable on every TV, a washer/dryer, a highchair seat and pack ‘n play, and gravel driveway. And you don’t have to leave your canine best friends at home. You’re welcome to bring two well-behaved dogs with you to enjoy your very special vacation. 11/18 - Nice lay out for three different families with children. Good experience in communication and courtesy. 11/18 - Great views, enjoyed the hot tub and the fire pit, grandkids loved the air hockey table, good bedroom configuration, beautiful deck area. Great company, would use you all again. 10/18 - The cleanliness of this cabin impressed me the most. Fantastic company. 10/18 - It was refreshing to come into a cabin that was clean. Nice furnishings very comfortable. The home is very close to downtown. 10/18 - My kids and I got a warm feeling as soon as we parked in front of the house. Professional company and excellent service. 06/18 - The cabin and amenities were excellent! Staff are service oriented and professional overall. 05/18 - The cabin feels like complete isolation, but is literally 5 minutes to Main St. Blue Ridge. You could ride a bike. Very high end cabin community with good roads. Company is very easy to deal with. 05/18 - Each bedroom has its own private bath. Wood burning fireplace with wood on-site made it very nice.Very professional. We liked the laundered sheets. 06/18 - Proximity to downtown and the lake. Complete privacy and character. Not just another faux log cabin next to others. Escape to Blue Ridge is very easy to work with, lots of choices. 06/18 - The cabin is immaculate. A very livable space with privacy for multiple guests. The kids loved the oversized jacuzzi and the creek. Complete privacy, the Mountain Tops community has an adorable chapel in it. We signed the guest book. First class company.